Just in time for Winter! This toy blaster makes and launches softball-sized snowballs up to 50′, allowing rapid, long-range assaults during neighborhood snowball confrontations. Simply place snow in the forming chamber and close the lid; it packs three perfectly spherical snowballs. To blast your mark, place one snowball in the muzzle, aim the launcher, and pull back the slingshot mechanism. Get revenge on those darn neighborhood kids. Blam! 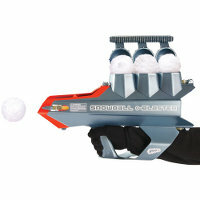 This snow ball blaster is AWESOME!!! Can’t wait to nail my sister in the head a few times!